The last thing the American people need is for some pissed off redneck to kill obama and him to be “martyrized”. It is far better for us all if he kills himself. Prosecute any citizen who desecrates the flag of the United States of America. In recent years the desecration of the flag of the United States of America by U.S. citizens has been increasing and there have been no repercussions for those involved. It clearly states under Title 18 of the U.S. code Chapter 33 Section 700 that “Whoever knowingly mutilates, defaces, physically defiles, burns, maintains on the floor or ground, or tramples upon any flag of the United States shall be fined under this title or imprisoned for not more than one year, or both.” U.S. citizens who are caught desecrating the flag of the United States of America should be held accountable for their actions accordingly. This It is a federal offense and action needs to be taken. UNITED STATES v. EICHMAN ET AL. After this Court held, in Texas v. Johnson, 491 U.S. 397 , that a Texas statute criminalizing desecration of the United States flag in a way that the actor knew would seriously offend onlookers was unconstitutional as applied to an individual who had burned a flag during a political protest, Congress passed the Flag Protection Act of 1989. The Act criminalizes the conduct of anyone who “knowingly mutilates, defaces, physically defiles, burns, maintains on the floor or ground, or tramples upon” a United States flag, except conduct related to the disposal of a “worn or soiled” flag. Subsequently, appellees were prosecuted in the District Courts for violating the Act: some for knowingly burning several flags while protesting various aspects of the Government’s policies, and others, in a separate incident, for knowingly burning a flag while protesting the Act’s passage. In each case, appellees moved to dismiss the charges on the ground that the Act violates the First Amendment. Both District Courts, following Johnson, supra, held the Act unconstitutional as applied and dismissed the charges…. ….Although the Flag Protection Act contains no explicit content-based limitation on the scope of prohibited conduct, it is nevertheless clear that the Government’s asserted interest is “related `to the suppression of free expression,'” 491 U.S., at 410 , and concerned with the content of such expression. The Government’s interest in protecting the “physical integrity” [496 U.S. 310, 316] of a privately owned flag 5 rests upon a perceived need to preserve the flag’s status as a symbol of our Nation and certain national ideals. But the mere destruction or disfigurement of a particular physical manifestation of the symbol, without more, does not diminish or otherwise affect the symbol itself in any way. For example, the secret destruction of a flag in one’s own basement would not threaten the flag’s recognized meaning. Rather, the Government’s desire to preserve the flag as a symbol for certain national ideals is implicated “only when a person’s treatment of the flag communicates [a] message” to others that is inconsistent with those ideals. 6 Ibid. [496 U.S. 310, 317]…. “….If there is a bedrock principle underlying the First Amendment, it is that the Government may not prohibit the expression of an idea simply because society finds the idea itself offensive or disagreeable.” Johnson, supra, at 414. Punishing desecration of the flag dilutes the very freedom that makes this emblem so revered, and worth revering. The judgments of the District Courts are Affirmed. Title 18, Chapter 33, Section 300 has no legal weight whatsoever. And the government, because of the First Amendment, can’t force you to believe otherwise. But, because of the First Amendment the government can’t and won’t do anything about that either. Because of the First Amendment. Ironic, eh? And that doesn’t mean good. Senator Tom Cotton’s letter to Iran is a direct violation of the Logan Act and should be prosecuted. Senator Tom Cotton and 46 others have written an Open Letter to the Iranian Government as an attempt to influence and interfere with our President’s current negotiations. This is a violation of the Logan Act, a United States federal law that forbids unauthorized citizens from negotiating with foreign governments. It was passed in 1799 and last amended in 1994. Violation of the Logan Act is a felony, punishable under federal law with imprisonment of up to three years. File charges of treason against the 47 Senators who sent letter to Iran. Attorney General of the United States of America please file TREASON charges against the 47 Republican Senators who sent a letter to Iran. Too undermind the President’s dealing to eliminate Iran’s nuclear weapons program. They are risking the security of this nation by their underhandedness and should be charged accordingly. All 47 Senators including Arkansas Republican Senator Tom Cotton. Senate Majority Leader Mitch McConnell (R-KY), and presidential hopefuls Ted Cruz (R-TX), Rand Paul (R-KY) and Marco Rubio (R-FL). Should be formally charged and prosecuted by the laws of this land and the United States of America’s Constitution. Immediately file charges against the 47 Senators who have sent a “warning letter” to Iran, under the Logan Act. A call for criminal charges to be filed for the 47 Senators who are undermining the President’s ability to conduct negotiations with Iran to PREVENT war. Address and prosecute the clear violation of the Logan Act by the Republican senators’ March 9th open letter to Iran. The open letter to Iran’s leaders by 47 senators of March 9th, warning them that any nuclear deal they sign with the Obama administration won’t last after Obama leaves office, is a clear and direct violation of the Logan Act and is treasonous. This action must not go unaddressed. We petition the White House and the Justice Dept. to take immediate and decisive action. File charges against the Senators who sent a letter to Iran. On March 9th 2015, members of the Senate of the United States sent a letter to the leaders of Iran urging them to go against the Obama administration over a nuclear deal. The letter was organized by Senator Tom Cotton and had the signatures of a total of 47 Senators. This was a clear violation of law and those Senators crossed a huge line when they tried to sabotage the negotiations of the Administration. Foreign policy should be dealt by the executive branch, not the legislative. Not only does the letter attempt to undermine negotiations between the U.S. and Iran, but it is written in a condescending tone that could do great harm to the United States’ security. That is why we urge the Administration and the Justice Department to file charges against those Senators who signed the letter. It’s in the republican majority’s nature. Everybody else gets the grotesque overreach. They probably don’t. Mandate childhood vaccinations for all children, with exemptions solely for legitimate medical reasons. Medical exemptions should be the only childhood vaccination exemption allowed in the United States. The medical profession has spoken, childhood vaccinations are safe and one of the greatest scientific innovations in human history. Some parents fall victim to rumor and propaganda and decide to place other children’s lives at risk by refusing to vaccinate their children. These decisions are based on discredited research or biased opinions. This affects other children – not just the children of the parents making this decision. Given the recent Measles outbreak in California, a state with one of the highest % of unvaccinated children, along with outbreaks of other diseases in clusters of unvaccinated communities, the government must act now before this becomes a public health crisis. Require all parents to vaccinate their children, or be charged with child endangerment. Over the years, humans have been on this earth, we have developed a means to help us become immune to certain diseases, using one of our bodies most base functions of fighting off diseases our bodies have been exposed to previously. Vaccination is one of the most important things to keep us healthy and kill off deadly diseases. Recently, however there have been many parents who are outright refusing to vaccinate their children, based on misinformation. These people have single-handedly managed to spread and bring back diseases such as whooping cough, polio, measles and mumps. That is why we petition the Obama administration to make it illegal to not vaccinate your children. When parents refuse to vaccinate their children, they are endangering their children’s lives and the lives of others. There appears to be slightly more enthusiasm for the spread of contagion. Interestingly the last petition doesn’t provide a rationale for refusal. “Because” doesn’t cut it when it comes to public health issues. It never has. It has been long established legally and morally that public health and science trump “just because”. Urge Sony pictures to release the film “The Interview” and protect our 1st Amendment. We the people of the United States of America feel that our 1st amendment is under attack by a foreign government. Our right to produce comedy motion pictures that depict anyone or anything is greatly at stake. We want our government to defend our first amendment by urging Sony to release “The Interview” and offer protection to movie goers as well as those involved in the production of the movie. Uh, it’s a violation of the First Amendment if Congress makes a law restricting access to the film. That hasn’t happened, has it? Encourage Sony to Distribute “The Interview” to Those Americans Who Wish to See the Film. If the people of the United States of America think seeing “The Interview” will make them happy, they should be allowed to do so from the safety of their own homes. Sony should be protected and allowed to digitally release “The Interview” for purchase as a digital download immediately. We cannot allow a foreign nation to terrorize our citizens out of seeing a harmless, satirical film. Take off your shoes. Get patted down at airports. Militarize the police force. Arm school teachers. Torture people. Drone-kill children. Wiretap all the phone. Pull one stupid comedy movie from theaters. Wouldn’t it be interesting to find out how preview audiences reacted? Stop Justin Bieber from getting deported. He is a human being and he makes mistakes. He does not deserve this. The whole idea of Justin Drew Bieber getting deported, is completely unfair. He doesn’t deserve this…. With your help, we can stop it. He’s human. He’s not perfect. The media sees the bad side of him. Please. He’s saved so many lives. Including mine. A lifesaver, Shouldn’t deserve this. Not as many as the anti-Canada crowd. A bill will be introduced, one way or the other, in the Missouri House in three, two, one…. Instruct the FAA to allow commercial operation of small UAS outside of populated areas. Only 156 signatures. This one isn’t quite setting the world on fire. White House Petitions: Is this a great country, or what? Replace President Obama with the rightful presidential successor, Daniel Willey. Daniel Willey has proved himself time and time again as the most capable person to run the United States of America. It’s time to let him do what he was born to do. 237 individuals have signed on to the petition. Think about that for a minute. the government, We the People has been temporarily disabled. 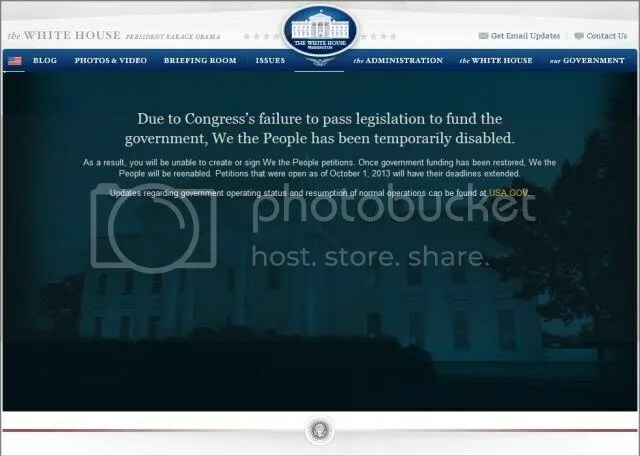 As a result, you will be unable to create or sign We the People petitions. Once government funding has been restored, We the People will be reenabled. Petitions that were open as of October 1, 2013 will have their deadlines extended. It appears the teabaggers in the House have stopped a vote.